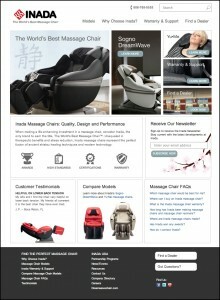 We’ve launched a beautiful new site for our client Inada USA, providers of The World’s Best Massage Chair™. That’s no hyperbole…We have one in the office. Check out the site: www.InadaUSA.com. It’s a convenient way to learn more about the Inada Sogno DreamWave and Yu•Me massage chairs and the shiatsu-based massage they offer. Better yet, stop by our offices and check out the chair!